I remember walking into the gym for a weightlifting/cardio class with my mom when I was probably 17. The room was full of people laying on their backs. Not knowing anything about yoga and shavasana (the ending rest and recovery period), I sarcastically said to my mom, “Why would anyone come to a class to do this? I can do this in my bed at home.” Little did I know how much I would enjoy yoga in the years to come. After getting back to the gym after Nate was born I decided to try a power yoga (Ashtanga) class. I was hooked! I had no idea I was capable enough to pull off what was being taught. 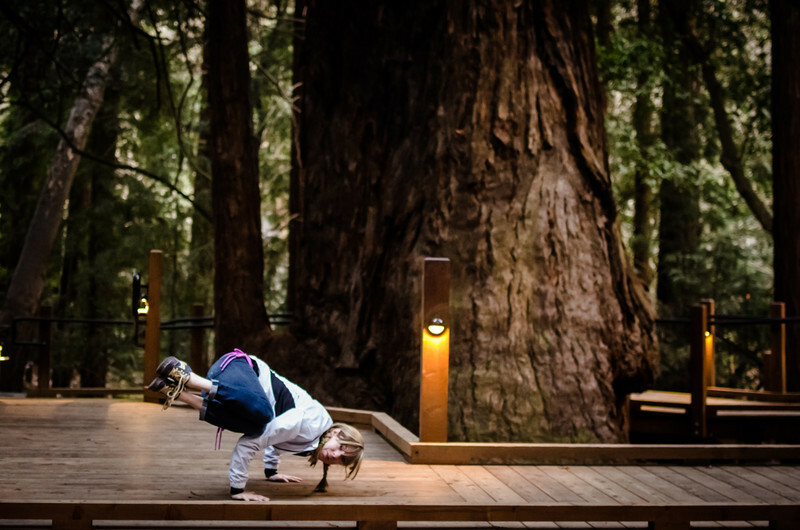 I’ve been going ever since except when I had to take time off during pregnancy (I could barely sit up without shooting pains let alone do a downdog!) and it took me over a year to get back to it after Cara was born. We moved and she needed a lot of attention and I just couldn’t seem to fit it in, regardless of the fact that it probably would’ve helped me feel better during that stressful time. My first class back I was elated! I could still do everything as before and I was being challenged as well. I was sweating and came home feeling good. In the last year I have outgrown that class and have started a new one in Provo at The Yoga Underground. The place is a hole, like shady-backroom-deals type of place. But I was once again challenged. In the rec center classes instructors use the layman’s terms for each pose but at real yoga studios they use Sanskrit and it all sounds the same! …and a million others. Ahhh! Are you serious?!! Every word ends in -asana (pose) and it’s so confusing! I recognize a few of the terms but I usually have to peek at what everyone else is doing. This class has are far fewer students so there is more one-on-one attention. Along with chiming music for warming up and cooling down, they also play modern music during the workout. Yay! 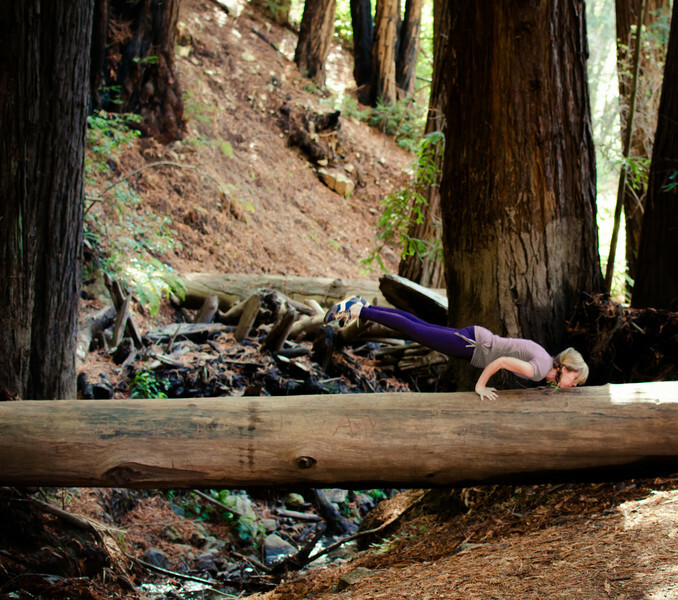 This class in particular specializes in arm balances, inversions, and twists. These are the things I’m most interested in. I realized I’m only getting older and will only be at my peak for another decade or less and if I don’t do this now I’ll always regret not pushing myself. I have all the people in my neighborhood who accomplish amazing physical goals to thank for that push, along with my other friends and loved ones. As far as the spiritual side of yoga, I feel like I get enough of a spiritual boost in my life already and am not interested in it during my workout. This class doesn’t push that. One interesting thing about yoga is how versatile it is. Every pose has multiple beginner, intermediate, and advanced versions so anyone can do it. Even for more advanced students it is very rare to be great at everything. Some people’s strengths are balance. Some are flexibility. Everyone has something they’re trying to improve upon. As small as they are, I have strong arms. I have no problem putting all my weight on them. 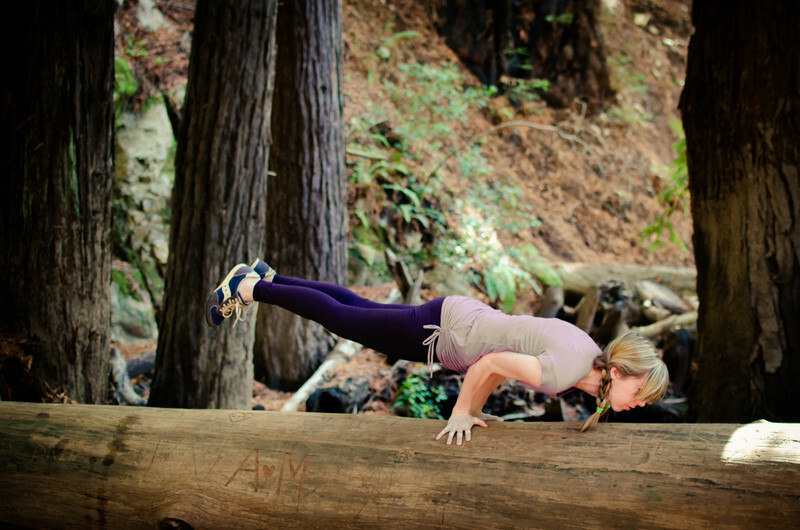 Arm balances come easily. I have a pretty flexible back. I’ve kept up my backbends through the years so that has helped a ton. I’d like to be able to bend even more and am working on that, but I’m not complaining. My stamina is pretty good. I can hold poses for a long time. Open hips. I have to be careful not to hyperextend them. Darn tight hamstrings. I’m not sure I’ll ever be able to do the splits or even very close. That rules out a lot of beautiful poses. I can do them but they don’t look so hot with bent legs. Balance. Granted, this has improved a lot over the years but it’s still not very good. I blame my skeleton for this. When I stand with my legs together, both my knees point inward towards each other rather than straight out. Maybe that’s impeding my splits as well. Stress relief! I think waaaaay too much most of the time but when I’m practicing yoga my mind is on one thing. It really relaxes my brain. I’ve learned to breathe. In moments of anxiety or stress I use my yoga breath to calm my nerves. Works. Toned muscles. I haven’t been able to get my stomach flat (I blame other things for that which I won’t mention here) but everywhere else is tight. It feels oh so amazing! Stretching feels as good as anything in the world. Also, whenever I stop doing yoga for a period of time my backaches return. Joy. It’s fun! When I practice at home I have anywhere between 1-3 kids and a husband doing it with me. They all love it. Okay, maybe the husband doesn’t love it but he acknowledges the benefit of doing it. I love being able to contort. There are so many different poses and I never get bored because every workout is different. I can’t prove this to be from yoga, but I now measure an inch taller than before I started yoga almost 8 years ago. I was always measured at 5′ 3/4″ from the time I was 18 until my last measurement when I was 24 and pregnant with Nate. Always 5′ 3/4″. That is, until last month when Rob measured me and then confirmed it when I was measured at my parents house a week later. I’m now 5′ 1 3/4″. What?!! I looked online and it’s impossible to have actually grown once in adulthood so the only thing I can think of is that yoga has straightened my spine and therefore making me stand taller. I routinely browse pinterest looking at all the fun poses people do around the world. I like to work on those poses when I’m practicing at home. Of the poses I Pin, I can do probably half of them well. 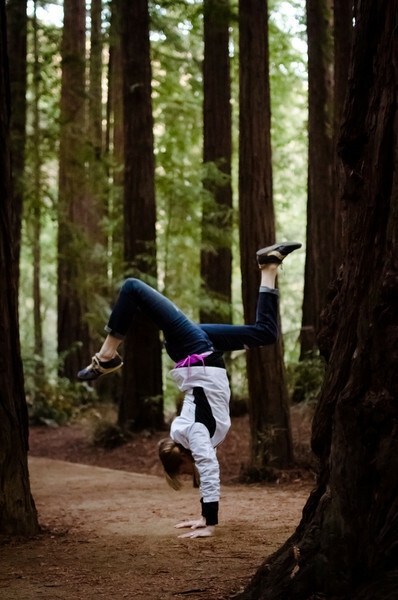 I wanted to try and recreate some of the postures in beautiful settings so I thought it’d be fun to have Rob photograph me while we were on our trip. Warrior III (Virabhadrasana III) on Half Moon Bay Beach. Why didn’t I think to do Half Moon pose?! 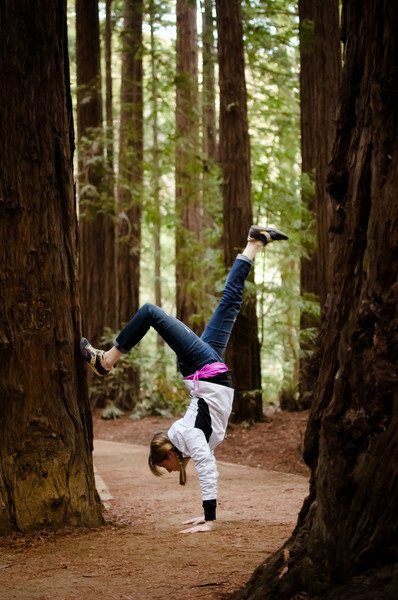 These are taken in the Redwoods in Big Sur. 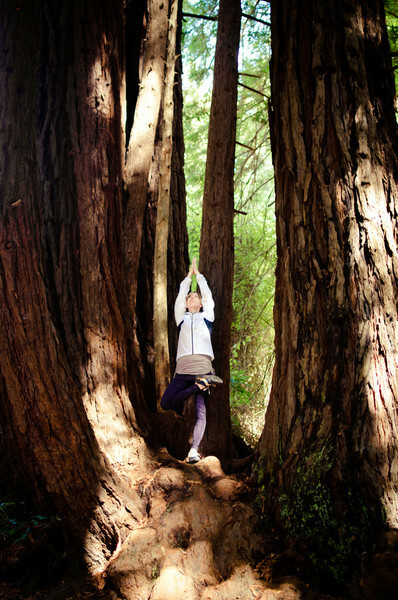 A version of tree pose (Vrksasana) while in a big tree! Working into scorpion (vrschikasana). I’m not there yet but maybe soon. 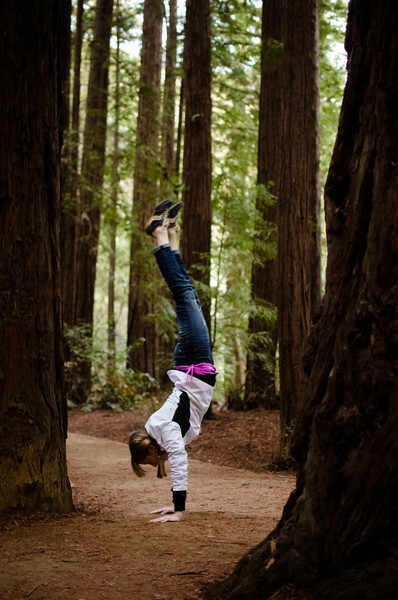 Two out of the hundreds of variations on a handstand (Adho Mukha Vrksasana). Anyway, I wrote this because Yoga has become an important part of my life and I thought I should talk about it. If any of you has even an inkling of interest in Yoga you should just try it. Don’t be intimidated, there is a level for everyone. If any of you are interested in joining me in a more advanced class I’d love to have a yoga buddy! Namaste (The divine in me acknowledges the divine in you).